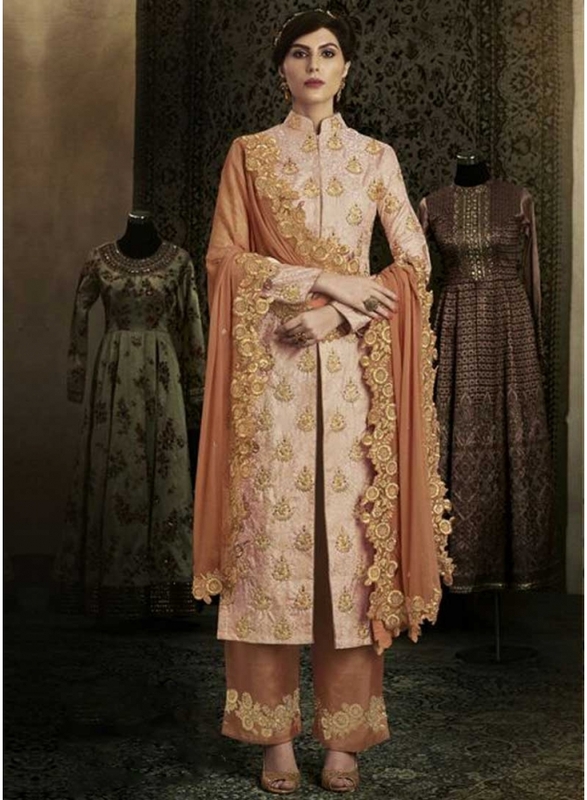 Peach Embroidery Zari Work Brocade Party Wear Pakistani Salwar Suit. Buy Online Shopping Salwar Kameez At -Australia. Peach Embroidery Zari Work Brocade Party Wear Pakistani Salwar Suit. Salwar Kameez is Brocade Fabric Top With Santoon Inner With Zari Work, Booti Work Lace Border And Full Sleeve Work Top. Bottom is Also Santoon Fabric. Comes With Matching Chiffon Dupatta With Lace Border Cut Work. --> The first wash of the garment should always be Dry-Cleaned. --> Blouse which is shown on model is only for modeling purpose. --> Every saree comes with one blouse only so we cant provide another same blouse but we can provide you plain blouse fabric on cotton, in such case extra charges will be applicable. --> Every saree comes with unstitched blouse, if you need stitched blouse then we can provide to you as per your given measurement and stitching charges will be applicable in such case. --> Underskirt (Petticoat) will not come with saree but if you need then we can provide you. --> If you need shimmer petticoat then extra charges will be applicable. --> Saree will be 6.10 meter with blouse fabric. Vertically it will be 40 to 42 inches wide so every person of height 6ft can be worn the saree easily. --> Heavy embroidered saree will come with unstitched blouse and that blouse will be one side embroidered. Embroidered part can be placed as per your choice whether you need it on front or back. If you need side opening, in such case embroidered part can be placed as per your choice. --> Blouse fabric will be of 85 cms so we can provide you blouse length upto 15 inches and sleeve length can be made 5 to 6 inches only. If you need long blouse and long sleeves in such case you should contact to our customer care department for that particular item. --> Bra pads can be added with your blouse if you need (For that Option will be given in the Measurement Form). --> You can Select Necklines from the Neck Designs Section. --> Blouse will be stitched with cotton lining. If any net sarees comes with shimmer fabric then lining will be used of the same fabric instead of cotton. --> Edging gives smooth end to the sarees. Fall are inner cotton lining used to protect the lower end of the sarees. --> Ready to wear saree provides easy way to drape the saree. In such concept tailor will be stitched the saree on petticoat as per your given measurement. Ready to wear saree can be worn just like skirt without the bother of tucking, pleating, and adjusting the pallu length as they are already set in the center to make you feel more comfortable and easy in wearing. The blouse however is worn separately. Ready to wear saree are becoming very popular as they are easy to drape. --> Measurement will be provided to your email id after placing the order so you can submit your exact body measurement with that form. --> For COD orders these changes will not allowed for the INSTOCK items and for other payment option changes allowed till 24hrs, further changes will not be considered in any case. Pink Colour Heavy Embroidery Multi Work Heavy Rasal Net Designer Salwar Kameez . This Salwar Kameez ..
Chikku Colour Embroidery Multi Work Heavy Net Designer Party Wear Salwar Kameez . This Salwar Kameez..
Turquoise Heavy Embroidery Hand Work Silk Net Designer Bridal Lehenga Choli. This beautiful choli is..
Orange Heavy Embroidery Hand Work Silk Net Designer Bridal Lehenga Choli. This beautiful choli is de..
ANGEL NX, Surat, Gujarat, (India) is a one of the leading Designer, Manufacturers, & Exporters. We offer Sarees, Lehenga Choli , Salwar Kameez and Bollywood Replica with awesome price and Finest Quality.